The role of concomitant extra-articular procedures in improving the outcome of ACL reconstruction has experienced a recent resurgence in interest. The aim of this article is to highlight the differences in philosophies and outcomes of historical lateral extra-articular tenodesis (LET) and contemporary, anterolateral reconstruction. A narrative review was performed using PubMed/MEDLINE using the keywords “lateral extra-articular tenodesis” and “anterolateral ligament reconstruction”. 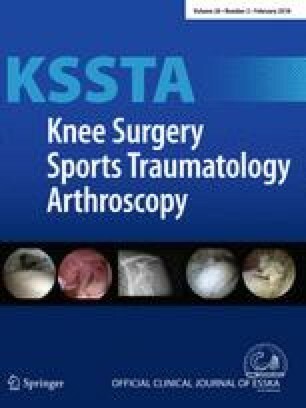 Results of search strategy: Thirty-seven studies [13 reporting clinical outcomes of isolated LET in ACL deficient knees and 24 comparing isolated anterior cruciate ligament reconstruction (ACLR) with ACLR + LET] and 1 study on anterolateral ligament (ALL) reconstruction were identified as relevant and included in the review. Results of literature review: Isolated extra-articular reconstructions are rarely performed in contemporary practice. They are associated with a high rate of persistent anterior instability and early degenerative change. Combined ACL reconstruction and lateral extra-articular tenodeses results in a significant reduction in the prevalence of residual pivot shift, but the majority of the studies do not demonstrate any significant difference with respect to patient-reported outcome measures and return to sport. Although several authors report a trend towards decreased graft rupture rates, significant differences were not demonstrated in most studies. In a single clinical study, combined anatomic ACL and anterolateral ligament reconstruction was reported to be associated with a threefold reduction in graft rupture rates and improved return to sport compared to isolated ACL graft choices. Historically performed, combined ACL reconstruction and lateral extra-articular tenodeses are associated with improved knee kinematics. Although trends towards decreased graft rupture rates are reported by several authors, the majority did not demonstrate a significant difference, likely as a result of small and underpowered studies using post-operative immobilisation and delayed rehabilitation protocols. More recently, combined ACLR and ALL reconstruction has been shown to be associated with significant improvements in graft failure and return to sport rates when compared to isolated ACLR. However, these results are from a single clinical series with only medium-term follow-up. One or more authors have declared the following potential conflict of interest or source of funding: B.S.-C. is a paid consultant, receives royalties and research support, and has made presentations for Arthrex. A.S. is a paid consultant and has made presentations for Arthrex. The authors confirm that no funding was received for this study. Institutional Research Board ethical approval is not required for review articles that include only data from previously published articles. Informed consent is not required for review articles.